Every detail reveals the thought and care that has gone into creating an elegant place for living well. Verde Apartments offers an unparalleled lifestyle with amenities unmatched by any other community in the Hershey, PA area. Our apartments in Hershey are the only community in the area with elevator access in each building. Our collection of apartments in Hershey, PA offer intuitive floor plans that maximize space, storage, and comfort while blending modern conveniences and charm. It’s important that our residents can live the lifestyle they want to which is why we are building a brand-new community building equipped with a state-of-the-art fitness center, lounge area with a flat screen television, and a grilling/picnic area for entertaining. Next to the fitness center, there will be a workout classroom equipped with Wexer Technology. Wexer is a leader in virtual fitness and their technology give you the ability to try a variety of workouts like cyberobics, cycling, yoga, and many more! We are continuously working to make sure our residents can feel at home and be a part of our community. Pedal: Bicycle friendly town with many local bike paths. 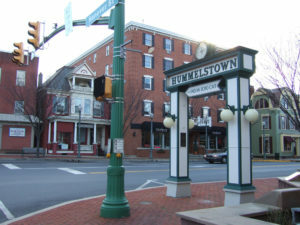 Swim: Walk to Hummelstown swim club community pool. We are a walkable town. With unparalleled community amenities, our apartment homes for rent in Hummelstown, PA are just minutes from Hershey Medical Center and Downtown Harrisburg, VERDE makes your favorite activities completely accessible. Whether you’re hosting a party in the clubroom, exercising in the fitness center with friends, enjoying fabulous shopping at nearby Hershey Outlets, or enjoying Center City Harrisburg, you will be amazed at how enjoyable life becomes when you live at VERDE Apartments! PJ Scoops Ice Cream Stand is home to 55 flavors of fun! Verde’s apartments in Hershey, PA is located in a great neighborhood. We are located within the Lower Dauphin School District which offers five elementary schools, 1 middle school, and 1 high school. Learn more about the Lower Dauphin School District below and contact us for more information about our Hershey, PA apartments. Certain floor plans as well as individual apartment homes may have amenities and features that vary slightly depending on when they were constructed or updated. To discuss a specific floor plan or apartment home, please contact a VERDE Leasing Specialist at 717-566-5400 or visit us to take a tour.